Tim West gained valuable experience through INBRE Summer Scholars program and plans to pursue a career in medical device design. 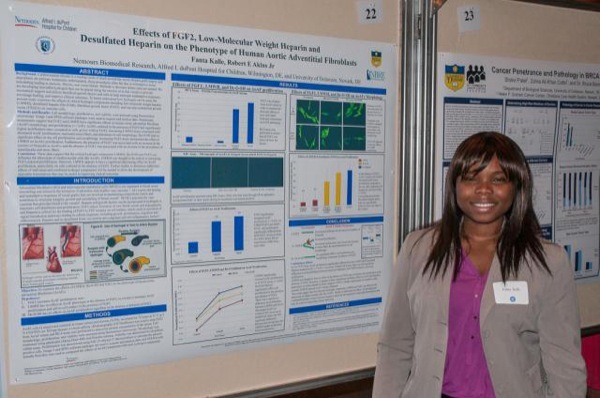 INBRE Summer Scholar Fante Kalle hopes to become a physician and to open a medical laboratory in her native Guinea. 10:02 a.m., Feb. 28, 2014--For the University of Delaware’s Cole Galloway, students are one of the keys to his success. “I need them because I’m not hip, I don’t know what’s weird,” said Galloway, who soon plans to start a student-run start-up that doubles as an undergraduate course. It’s this philosophy that drives the well-known professor and interim Department of Physical Therapy chair to host summer scholars each year. This year, the deadline to apply for summer scholars programs, like INBRE Summer Scholars, is Monday, March 3, at 5 p.m. And it’s never too early to start planning for next summer. The idea behind summer scholars is to help students as they navigate college and seek direction for their future, as well as give them real world experience. “They get in the lab with the researchers, hands-on research doing the work, doing training,” said Rebekah Helton, chair of Delaware INBRE’s education and professional development core. INBRE -- the IDeA Network of Biomedical Research Excellence -- is a National Institutes of Health-funded research partnership comprised of biomedical researchers across Delaware, including at UD, Nemours, Christiana Care Health System, Delaware State University, Delaware Technical Community College and Wesley College. Since 2002, roughly 390 students have gone through INBRE Summer Scholars, supported for 10 weeks on a stipend. This year, the program runs from June 9 through Aug. 15. Tim West, an Honors Program student, first heard about INBRE Summer Scholars through his advisers and professors. Now a junior majoring in biomedical engineering, West decided early in his sophomore year he wanted to pursue the opportunity to do hands-on research through INBRE. “I knew I wanted more experience and direction to move my career forward,” West said. He toured labs and emailed professors with whom he was interested in working. He connected with Jill Higginson, an associate professor in mechanical engineering, biomechanics and movement science and director of the Center for Biomedical Engineering Research. West spent the summer working with one of her graduate students, hand tracing MRI images to create three-dimensional models of the knee. West took from the lab valuable lessons about research and data analysis and it led him to Galloway after his summer scholars time ended. Now, he’s helping with computer design on Galloway’s GoBabyGo project, which is focused on improving mobility for children with disabilities. West wants to pursue medical device design and is eyeing opportunities in industry this summer. Fanta Kalle’s motivations to become an INBRE Summer Scholar were somewhat different. She first became a summer scholar in 2012, after transferring from Delaware Technical Community College’s Stanton campus to UD. Kalle, a senior majoring in cellular and molecular biology and genetics, had already been actively involved in research while at Delaware Tech. She spent her summer at Nemours/Alfred I. duPont Hospital for Children, researching health disparities in kids with asthma. She was struck by the interdisciplinary teams at Nemours -- nurses, doctors and researchers -- working together to solve problems. 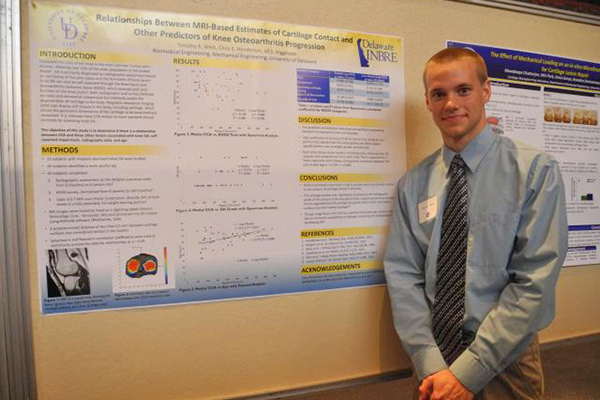 “To be involved in research and make connections gave me a rare insight,” Kalle said. She later joined the lab of Robert Akins, an adjunct professor at UD and head, tissue engineering and regenerative medicine researcher at Nemours, completing her senior thesis based on her work there. As a physician, Kalle hopes to work collaboratively with researchers and to participate in research herself, as well. Her ultimate goal is to open a medical laboratory in her native country of Guinea. But without the support of programs like INBRE Summer Scholars, Kalle said all of the lessons she’s learned and insight she’s gained would not have been possible. Also through INBRE, Kalle and West learned how to make posters to present their work. At a full-day retreat, they were taught how to communicate their research to non-scientists, participated in professional development sessions, learned about scholarship opportunities and more. At the end of the summer, they presented their work at the UD Undergraduate Research and Service Scholars Celebratory Symposium.